Intrigued by Thomas Jefferson’s calendar of the Washington city market (see the previous post) and liking the design, I decided to use it as a model for mapping produce available right here, right now. 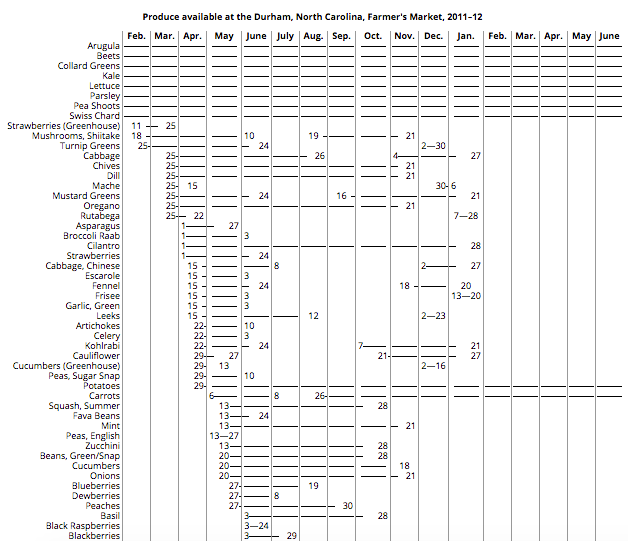 So with some help from Erin Kauffman, market manager for the Durham Farmers’ Market, I compiled a produce calendar for Durham, North Carolina, 2011. I offer the chart with a few caveats. First, I had data for only thirteen months (January 2011 through January 2012). My intent is to update it periodically as I have time, but be aware that it reflects a single year and doesn’t show the inevitable variability from one growing season to the next. Second, my data came mainly from farmers’ self-reporting. While I don’t believe that led to any serious inaccuracies, it did create some inconsistencies that I did my best to reconcile. For example, some people listed tatsoi, bok choy, and mizuna separately, while others lumped them under the heading of “Asian greens.” Then again, I don’t expect that Jefferson’s data was necessarily any more reliable: it still gives a good snapshot. Third, I omitted items that didn’t seem to have a “season” as such (that appeared only for a single week), and when something went missing for a week in the middle of a season, I assumed it to be a fluke. Both sorts of blips would be smoothed out if I were looking at multiple years. Just five years ago, this table would have been far shorter, and its length is a credit to the amazing community of farmers we have in the Piedmont. Unfortunately, it also makes the chart a little tough to read, since you quickly scroll past the header with the months. If you mouse over the name of each produce item, you’ll see the dates for its availability, and when I have time, I want to find a way to fix that header in place.